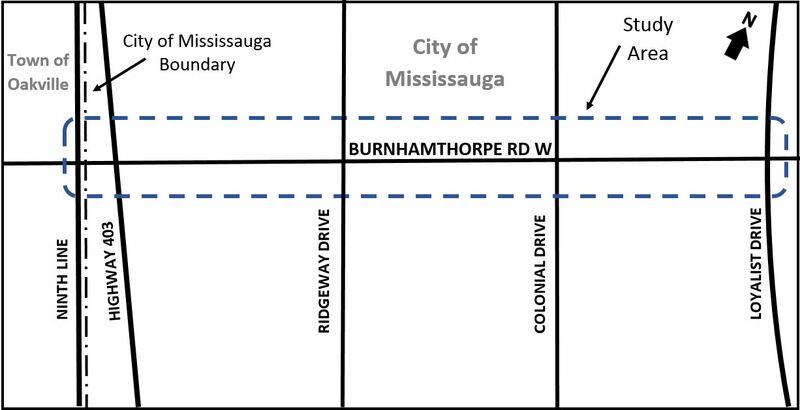 The City of Mississauga has initiated a study to review the existing and future transportation needs of the Burnhamthorpe Road corridor. The study area includes Burnhamthorpe Road West from Loyalist Drive to the West City Limit. This Class EA study will consider the City's planning principle to build a multi-modal city, which will support a successful, vibrant and active community with a reliance on a range of transportation modes including walking, cycling, transit and vehicles. The study will be conducted as a 'Schedule C' project under the Municipal Class Environmental Assessment (October 2000, as amended in 2015), which is approved under the Ontario Environmental Assessment Act. Public participation is an important part of the Class EA process. Throughout the study, the City will make contact with various agencies and members of the community, and consider their opinions as part of any decisions that are made.